Join us for a HOMEMADE BREAKFAST! Only available at our Mission Blvd location. BREAKFAST DAYS: Saturday & Sunday, 7 am-11 am. About our bakery: Although we have been baking our own cookies from Grandma Margaret’s recipes since 1993, we expanded our range of pastries in 2010 when we opened our cafe and started serving a full breakfast. 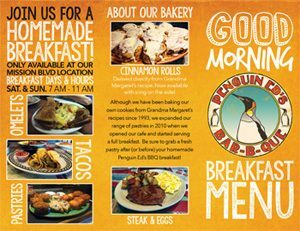 Be sure to grab a fresh pastry after (or before) your homemade Pengin Ed’s BBQ breakfast! Our cinnamon rolls are derived directly from Grandma Margaret’s recipe, and are now available with icing on the side! A skillet mix of home fried potatoes, onions , jalapenos, & chorizo sausage, topped with melted cheddar & mozzarella cheeses and salsa. Then topped with two eggs, and Texas Toast or a pancake. A skillet mix of home fried potatoes, green peppers, onions , mushrooms & tomatoes, topped with melted cheddar & mozzarella cheeses. Then topped with two eggs, and Texas Toast or a pancake. Two slices of Texas toast dipped in eggs, topped with powdered sugar & served with syrup & your choice of a side of bacon or sausage. Homemade quiche served with a side of home fries. Choose from our bacon, cheddar, onion quiche or Florentine. Seasoned 4 oz. Ribeye steak cooked just the way you like, 2 eggs, home fries & Texas toast or a pancake. Two eggs, home fries, bacon or sausage, and toast or a pancake. Three eggs, home fries, bacon, sausage, and toast or a pancake. It's tough to find a deal like this one these days! Two eggs & home fries with toast or a pancake. Our omelets are made from three eggs and served with home fries, as well as your choice of white or wheat toast. Ham, cheddar & mozzarella cheese. Add green peppers or onions for just $0.50. Cheddar, mozzarella, green peppers, salsa & chorizo sausage. Spinach, mushrooms, onions & Swiss cheese. Two of our Veggie or Chorizo tacos served in soft, corn tortillas with black beans, sour cream & Pico de Gallo. (Kids 12 & younger). Three dollar buttermilk pancakes served with one scrambled egg & small drink. Homemade and dripping with frosting. Homemade blueberry or morning glory muffin. Colossal homemade triple berry scone. Made from scratch & stuffed with smoked Polish sausage. Coke, Diet Coke, Coke Zero, Dr.Pepper, Sprite, Root Beer, Orange Fanta, Hi-C Fruit Punch. Made with locally roasted coffee beans! Ask about our caffeinated and decaffeinated options. Consuming undercooked eggs may increase your risk of foodborne illness, especially if you have certain medical conditions.